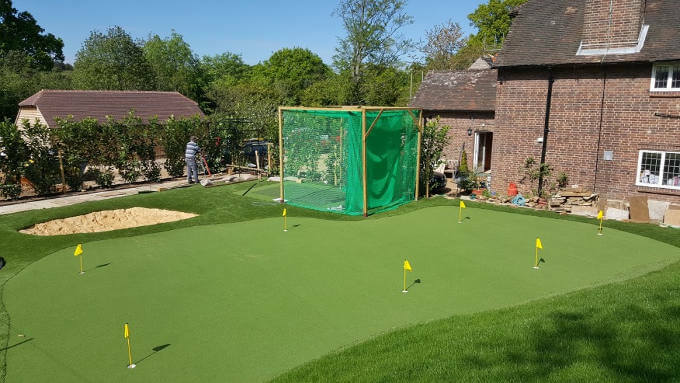 If you’re a golfer who would love to practice and improve their putting game, there may be no better option that to have your own putting green in your garden. Whether you’re looking to take strokes off your game or just wind down in the evening with some relaxing putting, this can be a fantastic investment. But if you’ve decided on installing a green, you need to choose between real and artificial grass. Let’s take a look at how this choice will impact some of the fundamental aspects of having a garden putting green. The first thing to note in terms of the differences between real and artificial putting greens is where they can be placed. The appearance and health of real grass can depend on the condition and type of soil that has been used as well as how much sunlight the green gets. This means that it may be very difficult to build or maintain a natural lawn in the shade or in parts of your garden where the soil lacks the right nutrients. Artificial grass, on the other hand, can be placed anywhere and doesn’t require sunlight or maintenance to stay pristine and beautiful. If your garden lacks the conditions necessary for a real putting green, you won’t have any problems having an artificial model installed. The costs involved with having a putting green fitted largely depend on the current state of your garden. It may be the case that you already have high quality grass that could be mowed and cared for specifically so that it can be used as an effective putting green. Otherwise you may have to choose between installing real or artificial turf. Natural grass may be cheaper but this can depend on the design and the location (for example, if you have to add soil to the garden). It’s also true that with real grass you will have to wait for it to grow, whereas artificial grass is available all year round. Real lawns are undoubtedly beautiful when they are properly maintained, but it’s worth remembering that it’s easy for them to wear down and have other problems. If you have pets or children they can run around and cause holes or divots in the green. If you play too much it can also cause the grass to wear out and die. These are not problems that you will have to deal with if you have an artificial putting green installed. It will take far longer for the synthetic grass to wear down, so if you’re going to get a lot of practice out of your green it can be smarter to opt for artificial over real. There is no doubt that the most challenging aspect of having a real grass green in your garden is the ongoing maintenance that you will have to carry out to keep it in fantastic condition. This includes everything from watering, weeding, edging and mowing. If you neglect these aspects of the maintenance it will become unplayable. Artificial grass requires minimal maintenance and will look and play fantastically without any effort that you have to put in after the installation. This is definitely something to consider if you don’t have the time to put in to keep a real lawn in first class condition. Naturally perhaps the most important aspect of a garden putting green is how it plays. 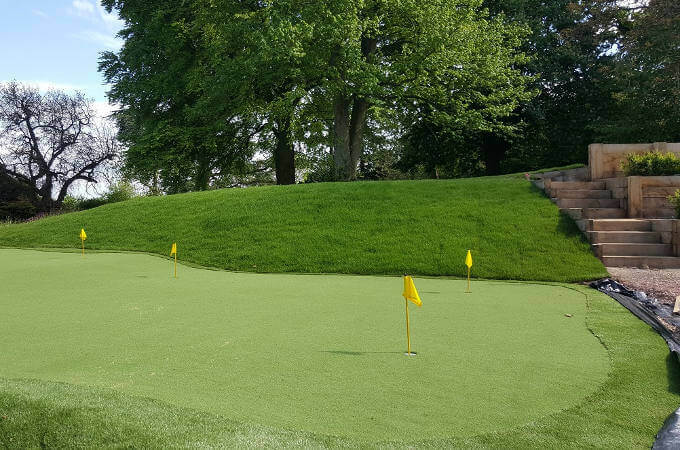 There are many who will tell you that nothing can match real grass for emulating the golf course, however with recent innovations in artificial putting greens, it can be almost impossible to tell the difference.